It’s Kids Clothes Week again – summer edition! There’s now a brand new community KCW website where you can upload your projects, check out other participants, and browse through patterns. The site is still a work in progress, but it’s really cool and just keeps getting better – I encourage you to check it out! If you haven’t visited yet, there are a few video tutorials on the KCW blog to help you get rolling: here’s how to register and sign up, and here’s how to add a project. And if sewing-related data entry sounds appealing, you can even help build the site by signing up to add patterns to the database. I’ve added a bunch, it’s fun! 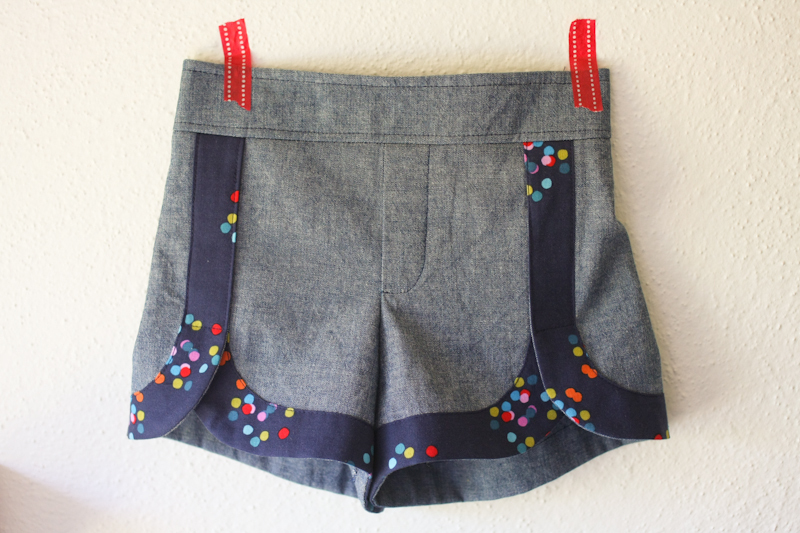 Anyhow, my first project is a pair of Oliver + S Class Picnic Shorts. As I was thinking about sewing for the summer, I realized Lila is about to size out of all of my Oliver + S patterns (boo hoo!). So I figured I better get some final use out of them. 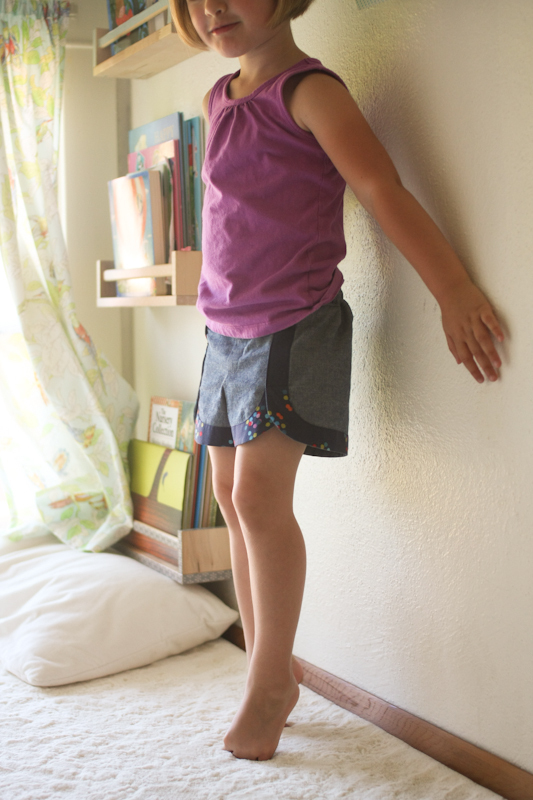 I loved her in last year’s Class Picnic Shorts and secretly hoped I’d get them out this summer and they’d still fit. But alas, she is no longer a size 2. I ended up making these in a size 4, but I think a 3 would have fit fine. I had to cinch up the elastic quite a bit in the back, but it works, and I think I’ll be glad I made them big when I get them out next summer! The main fabric is my tried and true Robert Kaufman chambray, same as I used for that first pair, but this time I went with a contrast fabric just to change things up. It’s from Rebecca Bischoff’s Blythe collection for Robert Kaufman. I made myself a Washi dress from this fabric, but I haven’t decided just yet if it’s fit for the public eye. 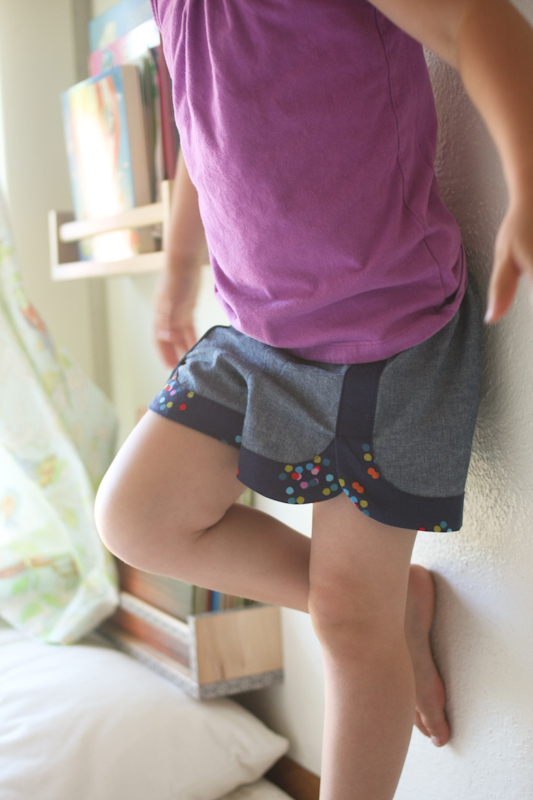 I love the fabric though, so I used some of the leftovers on these shorts. The only change I made when constructing these was using a little extra interfacing on the waistband – it calls for interfacing the waistband facing, but I added interfacing to the front waistband piece as well. The chambray is really lightweight, and the waistband on last year’s shorts was a little floppy. This one holds its shape better. That’s it for now, I hope to be back later in the week with more kids clothes! pretty, pretty! I have this pattern in the lower sizes too. I should check to see if s would still fit into it. I wanna see the washi dress:). These are so sweet! I think I need to try that pattern out. 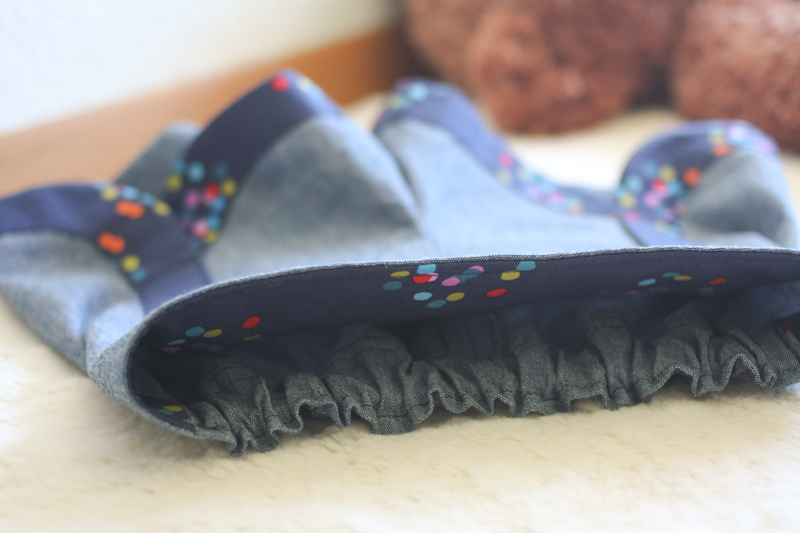 I love the blue fabric! So adorable! I have to get this pattern. 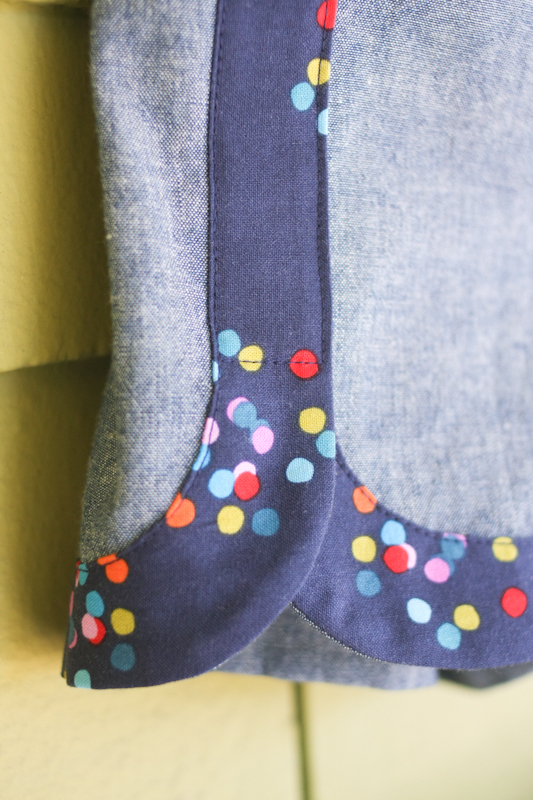 Ooh…I love the chambray paired with the polka dots….cute, cute, cute! 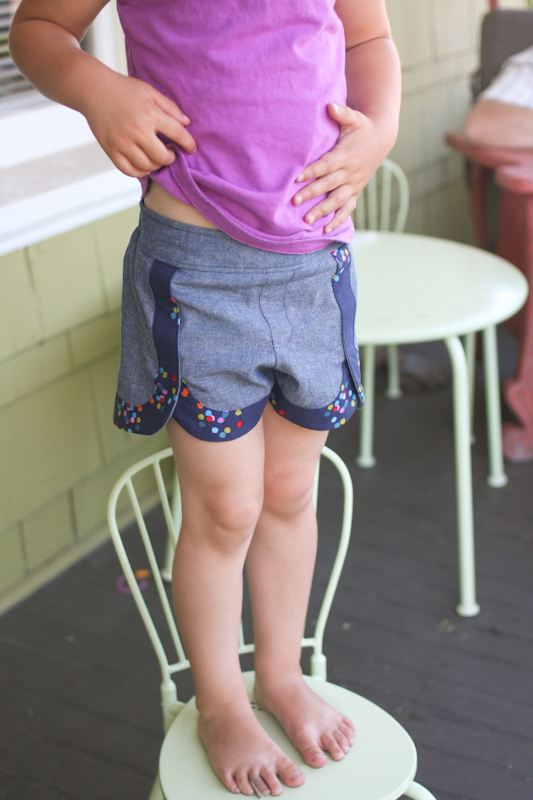 Contrasting trim on these shorts doesn’t always win me over but that “confetti” fabric is perfect. Great shorts. Very cute! Love the fabric combo. Gorgeousness! How is it that everything you make looks perfect? The polka dots are killing me. SO cute. Trop mimi, ce short !